After shopping for so many delicious wines and cheese in the Lake Erie Wine Country, we knew we’d have a fun night ahead of us. We picked a night where Diane and Brian could come over to Aunt Kathy and Uncle Gale’s house (her parents) and even Michelle (her daughter) was available. That meant there would be seven of us tasting wine and cheese. We had quite a menu chosen including four wines and four cheeses. Are you ready?? Hopefully we can all keep track of all these notes! 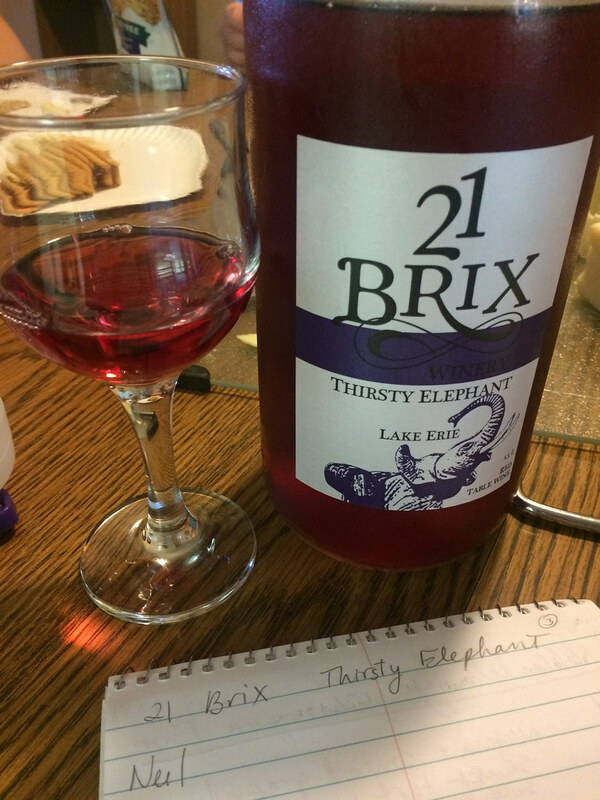 We began our wine tasting with 21 Brix Rosé. Neil and I had chosen this wine the weekend before when we were tasting with Diane and Brian. (http://wineandcheesefriday.com/wine-cheese-tasting-on-the-lake-erie-wine-trail/) Michelle doesn’t drink wine that often so we told her some things to do and look for, during wine tasting. She didn’t have that much to say about this wine but was kind of surprised that this rosé wasn’t very dry. Diane said it was a little dry but she also noticed raspberries. Aunt Kathy thought this wine was kind of sour and too dry for her. Brian picked up a hint of oak in the back of his palate and described the wine as semi-dry. Neil and I chose this wine because we thought it was less sweet than many of the wines in the region but we both still found it to be on the sweeter side. Neil noticed floral aromas and thought it was sweeter that night than when we tasted it at the winery. He found flavors that reminded him of watermelon jolly ranchers. I described the wine as light and agreed with the watermelon jolly ranchers. The wine seemed sweet, a little thick and it had a strawberry finish. I could also notice the oak that Brian picked up. Since everyone was saying it was dry, I wondered if they liked it. They all said they did except Aunt Kathy. Later that week, I tried this wine with dinner but it wasn’t really what I wanted. 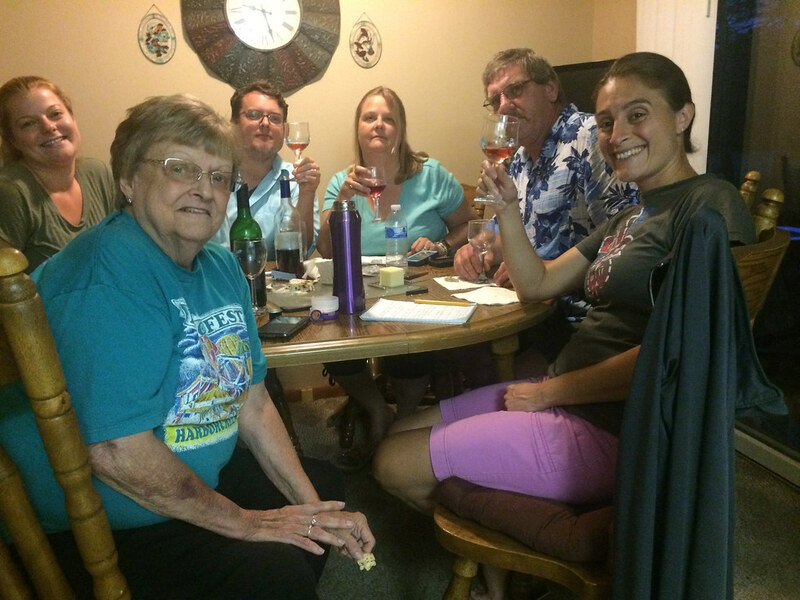 When Diane and Brian chose the Chataqua Eve from Noble Winery, they thought it was similar to another wine they tried from Heritage Winery, called Half and Half. Many of us tried Half and Half during our last group tasting so let’s see what everyone thinks. (http://wineandcheesefriday.com/wine-and-cheese-tasting-at-aunt-kathys-house/) Neil identified the niagara and concord grapes and thought it was sweet, tart and tasted like a strawberry hard candy. It was sweet but good! Diane also noticed it was bitter and sweet at the same time. This one was really, really good and her favorite wine of the tasting. Brian coined the term “sweetly tart” and said he’d drink this wine with dinner. Michelle really liked it too and said it was grapey! I definitely picked up the grapes too, saw some well defined legs and noticed that it was so sweet that it made my taste buds kind of jump out. I think it would have been too sweet for dinner. Aunt Kathy didn’t get much flavor out of it but she was tasting through stuff pretty quickly to catch up after arriving a little late that night. Uncle Gale said it “tastes like some more” so we know he liked it but he thought he liked the Half and Half a shade better. Nobody else mentioned the Half and Half so maybe we forgot to ask them about the comparison. As you look at the photo from this evening’s wine tasting, you’ll see that the Thirsty Elephant bottle was double the size of the other wines, that was probably a good choice. I was quick to make note of the pretty color, which Diane described as robust red. It smelled good with sweet, sugary and tart flavors. Michelle’s daughter Mallory gave it a sniff and said it smelled disgusting but she’s only 7. Brian noticed the Niagara grape aromas but the wine wasn’t as heavy as he’d expect it to be. He also described the color of wine as not as dark as the last one. Diane said this one wasn’t as sweet as the last one either. Maybe we should have switched the Chataqua Eve and the Thirsty Elephant’s order in the tasting? Diane thought this wine smelled like candy and there was a hint of cherry. She described the flavor as sweet but then it goes away. Michelle picked up on this same concept. She said the wine tasted sweet but not over sweet and then her mouth was dry at the end. I told her that meant this wine was probably high acid. She liked the combination of the wine with a cracker. She agreed that this wine smelled like candy and declared it her favorite wine! Aunt Kathy really liked this one too and said she’d buy her own bottle. She liked that it was smooth with a little bite and said although it’s on the sweet side, it’s wasn’t overbearing. Neil picked up candy aromas too but got more specific and said it was like a red bank lollipop. He described the texture as not that thick and found a light sweet flavor. With all the tasting notes, I’d say it’s a good thing we had that big bottle. Diane and Brian brought this Purview wine because they remembered it being “different.” They wanted to see what our thoughts would be. Diane made note of it being a strange color and almost foggy. We talked about how it could have been unfiltered. Brian thought the color was lighter than he would expect. Michelle agreed that it looked and smelled different than the others we tried that night. When Neil tried to identify the aroma, he decided to keep his thoughts to himself before everyone had a chance to try it. The consensus was that it certainly was a strange wine. People listed aromas of antiseptic, alcohol, cleaning fluid, cheese, barnyard funk, manure and dirty horse stable. As the tasting notes for flavors started going around there were oak, wood, a spice that could have been curry, peroxide, cinnamon, bay leaves, moss, and nutmeg listed. It was pretty clear that none of us really liked it. Aunt Kathy suggested that it might have smelled good as a candle. Brian thought that maybe it was warmed when he tried it at the winery? Oh well, it’s always fun to try a new wine even if you don’t like it. Although we weren’t sure if the family would be into a cheese similar to Brie, Neil and I brought it to the party. We figured it would at least introduce them to something different than what they normally eat. Brian thought it smelled like a very sharp swiss, similar to swiss Lorraine. He called it salty and picked up a wee bit of funk. It made him think of walking through a hayfield. Aunt Kathy thought the cheese left a film in her mouth and she didn’t care for it. Neil thought this would be a great cheese to bake. It wasn’t a runny Brie! He thought it smelled delicious and sharp. He identified flavors of butter cream, a little funk, and grassy green pastures. Michelle didn’t like the aroma and the flavor reminded her of olives. We figured out that it was likely aged in brine so that made a lot of sense. The flavor was bitter and she found the rind to be gross and strong. I didn’t have much to say about this cheese. It smelled like butter with a light funk. The flavor reminded me of cheddar and it had a thick texture. Diane said the cheese was creamy and she thought of salty pretzels. She agreed that it was thick, heavy and rich. The flavor was similar to hand churned butter. I guess the idea of butter was running through many of our minds during the Luna tasting. We had so many cheeses from our trip out to Reverie Creamery but I brought this Aldi cheese along as the cheese people would probably be familiar and comfortable with. Do we need that, well not really but I definitely sway toward the out of the ordinary cheeses in many tastings. Neil described this white cheddar as sharp and salty. Well come to think of it, we all said it was sharp! Uncle Gale did feel it could have been sharper but he still had a few pieces. I described it as a sharp, funky aroma with sharp, tart, cow’s milk flavors. Michelle and Neil found it to be a great example of what “cheddar” tastes like. Aunt Kathy said this was her favorite cheese. Diane liked it too but thought that she could use some extra salt on it to balance the sharp flavor. She described the texture as smooth and creamy but not quite as creamy as the Tom. 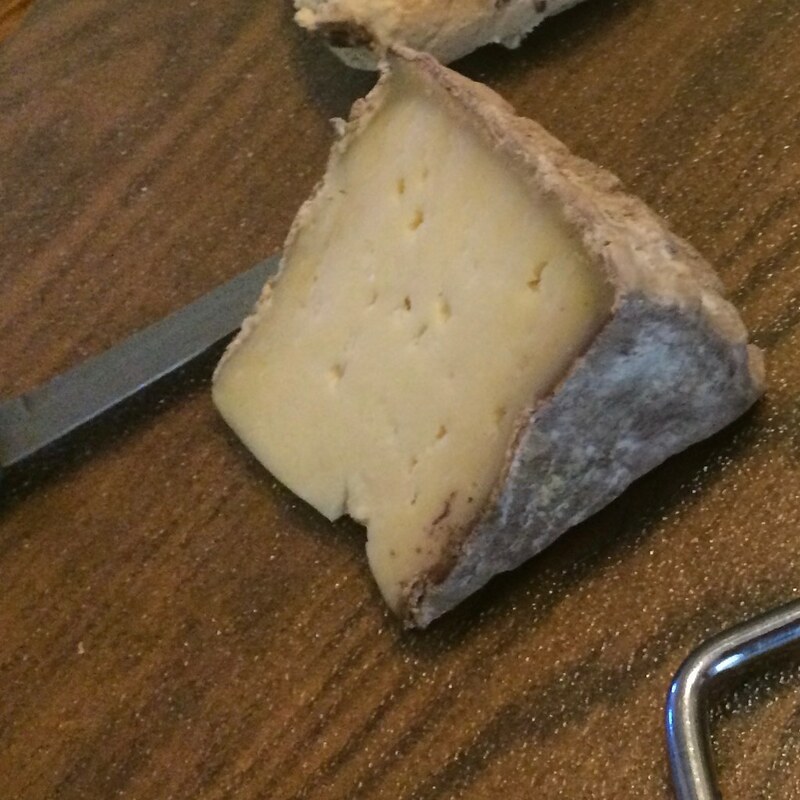 In order to describe the Tom cheese from Reverie Creamery, we took a closeup photo. Take a look at that gray wrinkly rind! A few of us described the aroma as a musty basement, but Diane thought it was also like dirty socks. Neil and I are more used to this type of cheese aroma so I just called it salty and funky. Although Neil said it was musty, it reminded him of the Luigi Guffanti cheese cave aroma and that made him happy. There was no doubt that this was all coming from the rind. The inside of the cheese was really creamy and smooth. Michelle thought it had kind of a funky taste that was similar to cheddar. Brian found it to be saltier than when we tried it in the store. Aunt Kathy said it wasn’t bad but she didn’t like the taste. After all the comments about the rind, I was curious to try it on its own. The flavor was earthy and tasted like dirt. There was also a funky finish. Love me an interesting cheese! Brian and Neil agreed, this was their favorite one. You may remember that when we tasted the Black Garlic Chèvre at Reverie Creamery, I thought it would be a good cheese to enjoy while tailgating. Let’s see what everyone else thought of it. Aunt Kathy said it would taste good if you spread it on warm bread that you ate with spaghetti. Diane noticed a sweet flavor and although she could taste the garlic, it wasn’t overpowering. She wanted to have it during happy hour. I enjoyed the aromas, with garlic flavors and some spice. It even seemed a little warm on my tongue. Michelle spread some of this cheese on a cracker and made a comment that “it didn’t smell bad.” She couldn’t really place the flavor but maybe it was like squeeze cheese. Well that started us down a path because Brian also picked up cheese whiz and it kind of reminded him of processed cheese. He was curious what the black garlic would taste like by itself? Neil was on board with turning this cheese into a garlic toast and noticed the goat cheese and sweet garlic. He thought it might be preserved in some way that would be similar to cheese whiz. With all that talk about squeeze cheese, you might think people didn’t like it but it had 3 votes for favorite cheese of the evening. After all that wine and cheese tasting, each person had specific wines and cheeses they wanted to pair. Although we all made our own choices of which pairings to create, I think we did a good job of choosing many combinations. 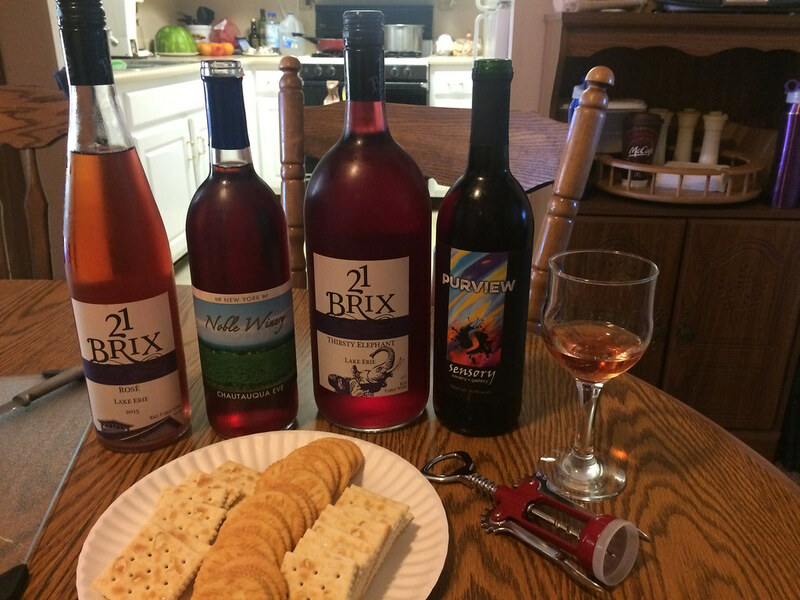 Let’s start with the 21 Brix Rose, Neil and I both paired it with the Tom. Neil found this to be a good pairing with more salt in the cheese and the rosé smoothed out. I agreed that the cheese was salty but it smelled different and seemed lighter. I felt the wine got sweeter, thicker and tasted like a different candy than before. Remember that big bottle of Thirsty Elephant? Quite a few people created pairings with that wine. Aunt Kathy tried it with the sharp cheddar but said they didn’t go well together. Michelle paired it with the garlic cheese but didn’t notice any change in either the wine or cheese. Diane did the same pairing of thirsty elephant and garlic cheese and said it was a good combination. 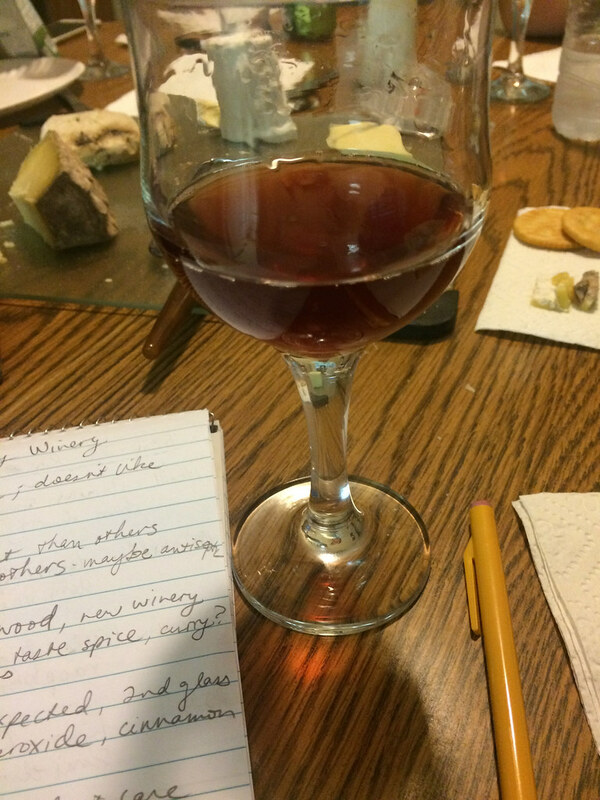 The wine was sweet, and the cheese had it’s garlic making the two flavors offset each other. She called it a good blend of flavor. Then I tried the wine with the Luna. I enjoyed the Luna but still don’t think it tasted like brie. The wine became sweeter and sugary like koolaid with the flavor of those candies that look like strawberries. The cheese still tasted like cheddar. There were a bunch of pairings using the Chataqua Eve wine also. Brian tried it with the garlic cheese but it wasn’t good. Diane paired this wine with the sharp cheddar and found another good combination. She said the flavors of wine and cheese blended and had the bitter flavors offset each other. Brian tried this same combo of Chataqua Eve and sharp cheddar and noticed the wine and cheese to neutralize each other. Diane tried one more pairing, using this wine with the Tom. She found them to complement each other by blending nicely. 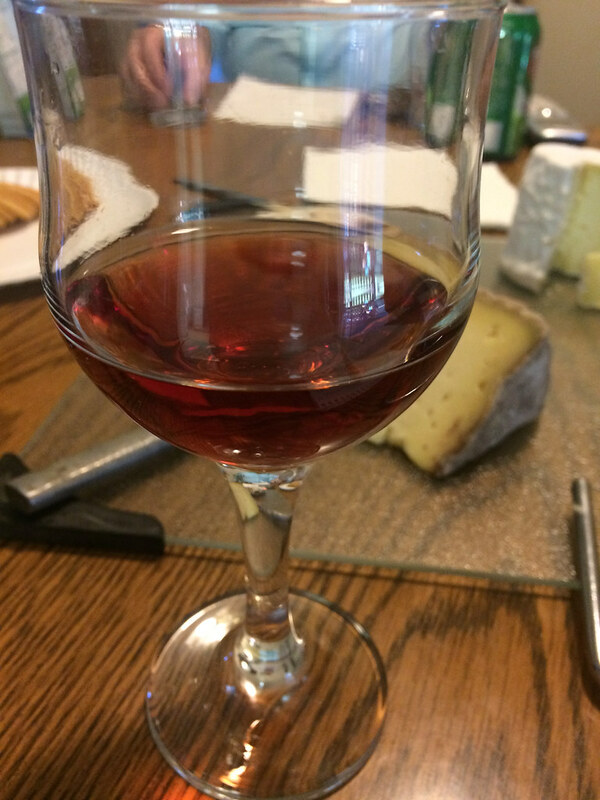 Before we stopped pairing, Brian braved the Purview wine one more time, matching it against the sharp cheddar but that was a no go. I think this was the most wine and cheese tasting Neil and I have ever done in one night. We keep setting the bar higher and higher! Did you notice that all of these wines were pink? Well pinkish anyway since the Purview was more red. What a fun way to celebrate #roseallday and the #pinksociety! If you are looking for wines that taste like candy, these are the ones for you. 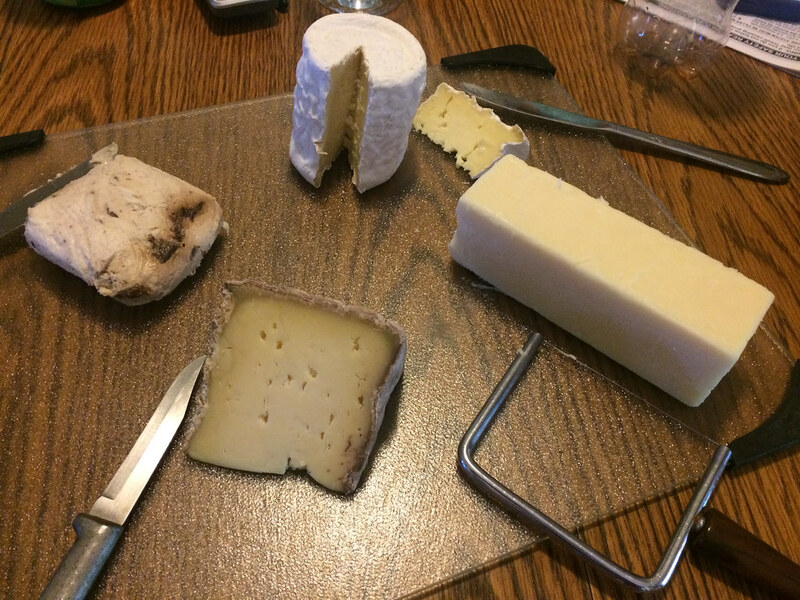 And we got to eat all that delicious cheese from Reverie Creamery. I know Neil’s family will be heading back there for more cheese. From all the choices of favorite cheese, it seems we didn’t even really need that “safe cheese” from Aldi. I’m proud of you guys! Some people found new wines that they will be looking for in the future. Or if you are Michelle, the very near future, she took some of the Thirsty Elephant home that night. We always have fun tasting wine and cheese with this group so I’m sure you’ll be reading about more pairings in Pennsylvania. Check back periodically on WineAndCheeseFriday.com!